The Ebola outbreak in West Africa has claimed more than 11,000 lives and focused the world’s attention on the need to strengthen health systems in developing communities. In today’s interconnected world, challenges that arise in communities with underdeveloped health systems can quickly be exacerbated to threaten even the most advanced systems. “During the initial outbreak in Guinea, for example, there was no laboratory to diagnose Ebola; it took two months to successfully get a sample tested by a laboratory in another country,” said Dr. Amadou Alpha Sall, regional Ebola expert for the Pasteur Institute of Dakar, Senegal. “This wait time, along with the lack of laboratory diagnostic testing capacity, proved fatal, and was a root cause of the spread of the disease.” The outbreak spread from Guinea to nine other countries, even outside Africa, within months. Since studies show that 70% of all medical decisions are based on laboratory results , laboratory services and diagnostic testing are the cornerstone of a robust healthcare system. Without the ability to quickly detect disease, monitor its spread, and initiate proper treatment for patients, community health and global health security are at risk. 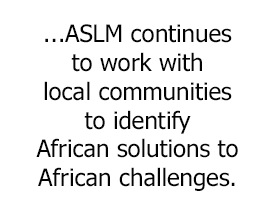 “Through collaborations with regional and international partners, ASLM leads the fight to enhance Africa’s local laboratory systems to meet growing health priorities and build laboratory networks for faster, more accurate disease detection,” said Dr. Trevor Peter, Chair of the ASLM Board of Directors. ASLM is the African Society for Laboratory Medicine (www.ASLM.org), an independent, pan-African professional body that coordinates, galvanises and mobilises relevant stakeholders – local, national and international – so that together, they improve local access to world-class laboratory services and ensure healthy African communities now and for the long-term. Improving laboratory capacity in order to achieve faster, more accurate testing results requires the enhanced capacity of local experts and expanded access to regional best practices. As the number of Ebola infections quickly increased and spread last year, ASLM deployed personnel to Sierra Leone to work with the US Centers for Disease Control and Prevention (CDC) and local partners in strengthening the ongoing national response and turn the tide of the epidemic. 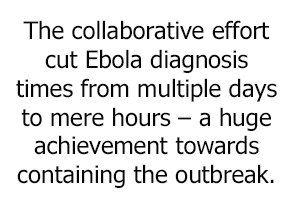 The collaborative effort cut Ebola diagnosis times from multiple days to mere hours – a huge achievement towards containing the outbreak. 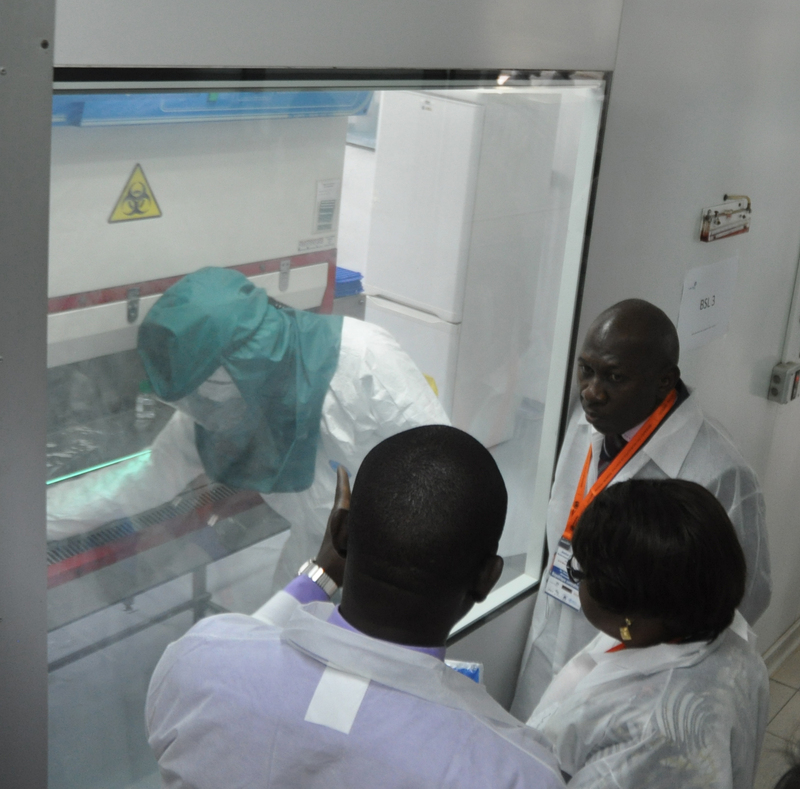 To accomplish this, ASLM and partners conducted on-the-ground assessments and trainings to institutionalise Ebola-related laboratory expertise and safe practices throughout Sierra Leone. A laboratory unit was established within the national emergency command centre and a technical working group of international and local partners was convened to ensure the sustainability and appropriate coordination of locally-driven capacity building activities. Building upon these successes in Sierra Leone, ASLM recently partnered with the Pasteur Institute of Dakar, Senegal, to conduct a regional francophone workshop for laboratory leaders from 12 countries to further expand local health workforce capacity and Ebola laboratory preparedness as well as to initiate the establishment of a regional outbreak laboratory network response. This networked laboratory system will work to prepare for and respond to future regional outbreaks – Ebola or otherwise. Additionally, ASLM experts remain active in working with national governments and regional stakeholders to further identify strengths and gaps in their local laboratory readiness using a standardised, validated checklist aligned with World Health Organization and Global Health Security agendas. The ASLM-developed consensus checklist will be implemented outside Sierra Leone in 10 target countries – including francophone Africa, where health systems remain weakest – in the coming months to assess and provide targeted technical assistance on Ebola laboratory capacity based on a comprehensive workplan. Even as the Ebola outbreak becomes more contained, health systems in Africa remain weak. An Ebola resurgence – or new, separate outbreak – remains possible. As international partners begin to pack up and return home, ASLM continues to work with local communities to identify African solutions to African challenges. ASLM has launched a landmark pan-African network of leading national laboratories, the African Public Health Laboratory Network (APHLN), to facilitate better disease detection and surveillance through the promotion of regional collaboration and coordination of needs. Public health laboratories are essential to managing major public health threats, including HIV/AIDS, tuberculosis, malaria, and emerging threats like Ebola. They are also critical components of national (and regional) healthcare delivery systems and play a key role in outbreak investigation, monitoring, and response. Through targeted, locally-driven strategies, ASLM leads the effort to transform the laboratory workforce and health services in Africa. Investing in Africa’s health systems improves global health security and ensures a sustainable, local response to future disease outbreaks. Silverstein MD. An approach to medical errors and patient safety in laboratory services. A white paper prepared for the Quality Institute Meeting—Making the Laboratory a Partner in Patients Safety 2003. Atlanta, GA. 2003 (suppl 2): S59-65.